a person who believes that a society or system should be led by an elite. "critics portray him as an out-of-touch elitist"
Clinton’s personality composite can be labeled elitist narcissism, or, in political terms, as the profile of a deliberative high-dominance introvert — deliberative by virtue of her substantial conscientiousness. #2 Hillary thought she controlled the message. As we will see below, the Hillary campaign thought they controlled the truth but did not. Not only did they have an almost limited amount of funds to project their message but the campaign was also going to skirt the rules and collaborate with her biggest PAC on messaging. 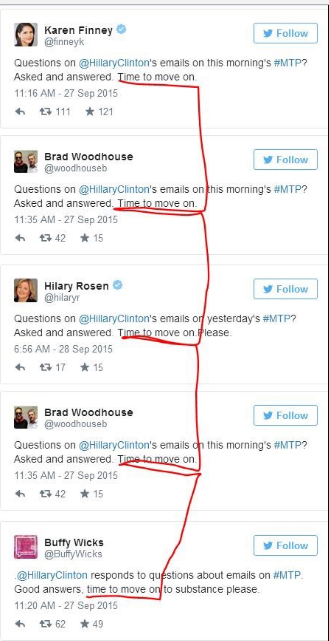 For the most part, the media was also in the tank for Hillary. She was an elitist would not rock their very comfortable boat. While they would ask her the tough questions, the would not press her on them. 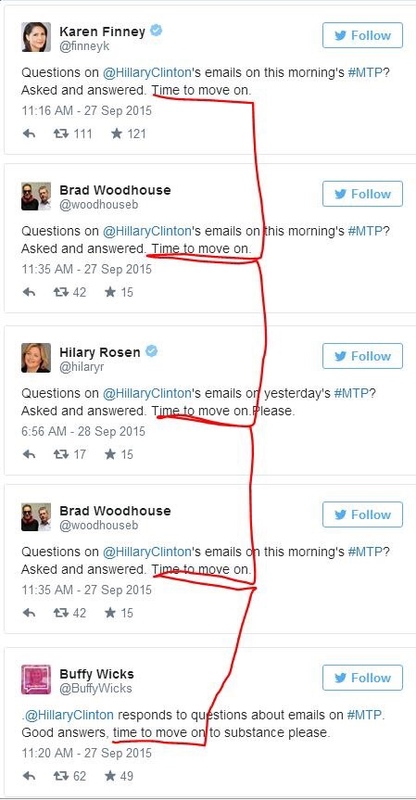 This is born out by major outlets eventually jumping on the "Times to Move On" boat too when it looked like the eMail scandal was tipping things in favor of Trump as shown later in this post. #3 The truth was so damaging that her campaign did not have the option of being forthright. One only has to skim the Wikileaks releases to understand just how devastating the eMails were to the whole Clinton family and Democrats in general. Half of all Americans say Clinton is “not at all” honest, with another 18 percent saying she’s slightly honest. 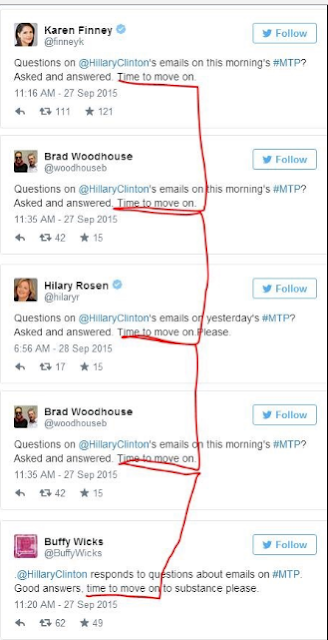 In concert with the big news shows, Clinton's Super PAC, Correct the Record, with dubious legality, coordinated, with the Hillary campaign to put out the message that Hillary had resolved the issue and it was "time to move on." The Washington Post interviews the Clinton Campaign and the Super PAC, Correct the Record, whom the campaign plans to coordinate and these parties justify the legality by citing the legality of coordination with unpaid blogging activity: The Washington Post then cites Jason Torchinsky, an election law attorney who represents many conservative groups. "If you are a super PAC paying people and coordinating your activities with the campaign, you are not covered by the individual Internet exemption and are making impermissible in-kind contributions." In the article Correct the Record claims that it can coordinate with the campaign as it is not involved in independent expenditures. www.realclearpolitics.com 2016/09/08 - Nancy Pelosi: Time To Move On From Hillary Clinton's Emails; "Too Much Ado About It"
"What she did was not something that endangered our national security. She said she shouldn't have done it that way -- that raises questions, which is unfortunate. But as I have said, it is much ado about something, but too much ado about it." "Hillary Clinton is in no way... We have to move on from this,"
"There are a thousand other substantive issues … that would have revealed more about what the candidates know and how they would govern,"
"Judging the amount of time [he] spent pressing Hillary Clinton on her emails," ... "one would think that her homebrew server was one of the most important issues facing the country this election. It is not." "Mr. Lauer seemed most energized interrogating Mrs. Clinton about her use of a personal email server while secretary of state," the Times' board wrote. "Focusing on it meant that other critical issues — like America's role in Afghanistan and its ties with China — went unaddressed." Going into this scandal, the Clinton campaign had three options: deny it, ignore it, or tell her side of it. And she’s done all three – horribly. From the quintessential Clintonian dismissal of such matters (“It’s not about Benghazi. It’s not about emails or a server either. It’s about politics.”) to her painful tone deafness regarding the potentially lethal impact on her campaign (“You may have seen that I have recently launched a Snapchat account … I love it — those messages disappear all by themselves.”), to her contrite recognition that perhaps the public was taking this more seriously than she was (“I should have used two emails – one personal, one for work – and I take responsibility for that decision.”), Clinton’s message has been anything but clarifying.